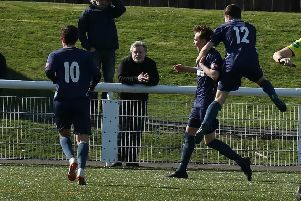 Dalbeattie Star’s unbeaten came to an end at Cumbernauld Colts last Saturday but thanks to Vale of Leithen’s defeat at Civil Service Strollers it was as we were before the match. Broadwood has never been the happiest hunting ground for the Star, so a 2-0 defeat could be seen as an improvement following 4-0 and 3-0 losses on previous visits. Star always seem to bring out the best in the Colts whenever they play them away and unfortunately for Dalbeattie this match was no different. Although they failed to register a single shot on target they did threaten the home goal with Farrel O’Sullivan setting up Lewis Sloan early on. That was about as good as it got the visitors as the hosts soon took control. They opened the scoring inside 20 minutes when Star failed to clear a cross from the left and Michael Wallace shot home from the edge of the box. Just before the break Star came close to an equaliser when Tom Smith fired narrowly over after good play by the two Lewis’s, Todd and Sloan. Ten minutes into the second half and Sloan fired a free kick just over the bar and two minutes later Wallace did the exact same at the other end. With chances at a premium the match was almost all but over when the home side doubled their lead midway through the half. Star again failed to deal with a cross and Gavin Lachlan had the easy job of heading home from just six yards. The visitors never gave up though and Jamie McHarrie and Liam Park both had decent efforts deflected over but it was not to be. DALBEATTIE STAR: V Parker, Park, Thorburn, Todd, Cameron, C Wilson, Smith (McKenna 69), Milligan, Degnan, Sloan (Thomson 80), O’Sullivan (McHarrie 64) Subs not used: Telfer, Mason.